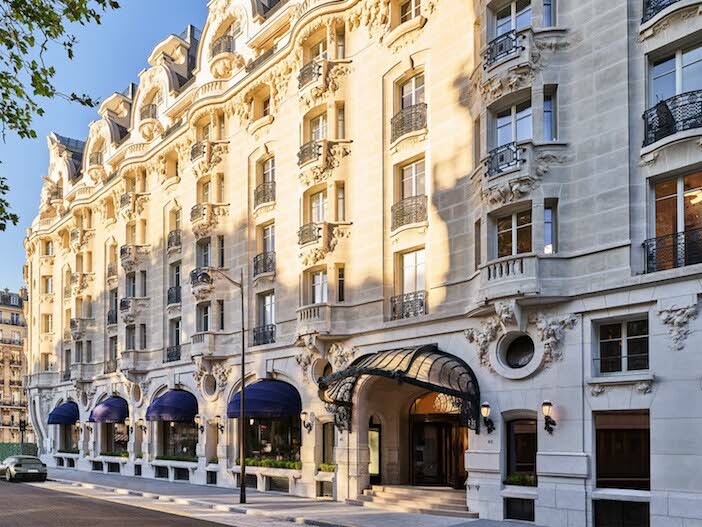 Paris – the very word conjures romance, beauty, elegance, luxury, all characteristics of the newly restored Hôtel Lutetia, which stands proudly like a huge Art Nouveau ocean liner on Boulevard Raspail in Saint-Germain-des-Prés on the ever-fashionable Left Bank, where she is the only grand hotel. This magnificent five-star grande dame reopened in July 2018 after a four-year renovation by architect Jean-Michel Wilmotte, who sympathetically combined heritage and original Art Nouveau and Deco features – including the impressive dark-wood revolving door at the entrance, parquet flooring, frescoes, gildings and mouldings – with modernity to maintain Lutetia’s history and beauty. She originally opened in 1910 to accommodate the clientele of nearby Le Bon Marché, and former guests include Ernest Hemingway, Pablo Picasso, André Gide, James Joyce (who wrote part of Ulysses here), Samuel Beckett and Josephine Baker. General de Gaulle spent his honeymoon here, film director David Lynch often stayed and habitué Serge Gainsbourg lived around the corner with Jane Birkin. Luxury is the theme of this weekend and it doesn’t get much more luxurious than this. In my suite, I’m greeted by 16 blush-pink roses, a bottle of Taittinger champagne, pastries, handmade chocolates and fresh fruit on a table by the balcony that overlooks the comings and goings of busy Parisians on the streets below. 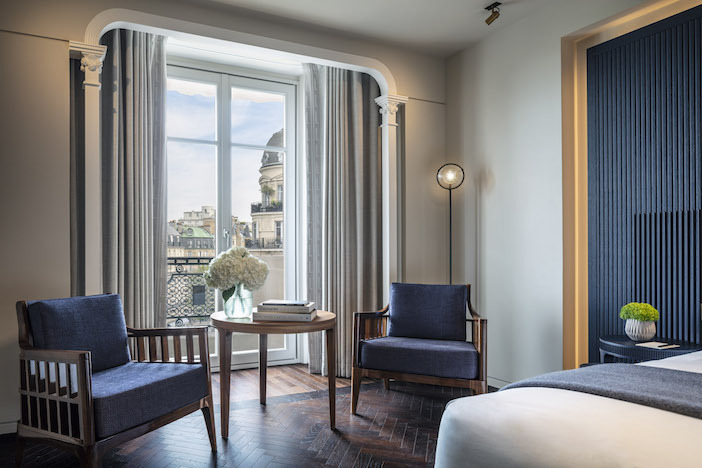 Opposite the balcony’s window, whose curtains, like the lights, are operated by the press of a button, is a king-sized bed against a navy blue (the designer’s favourite colour) wall with Murano glass lights. There’s also a writing desk, a sofa, a walk-in wardrobe and a fabulous Italian marble bathroom filled with Hermès Eau d’Orange Verte bath products, and while ‘fluffy white towels’ is a cliché, these really are the fluffiest ever. There’s a wet room should I require a shower, and the bath is hewn from a single piece of marble weighing two tonnes. How will I ever go home after this? Dragging myself from my suite, I head back to the ground floor for lunch at the hotel’s Saint Germain restaurant. As well as size (184 rooms, including 47 individually designed suites) and elegance, light is a notable factor in this hotel; communal rooms that a century ago would have been dark and filled with cigarette and cigar smoke are now opened up to let light flood in. 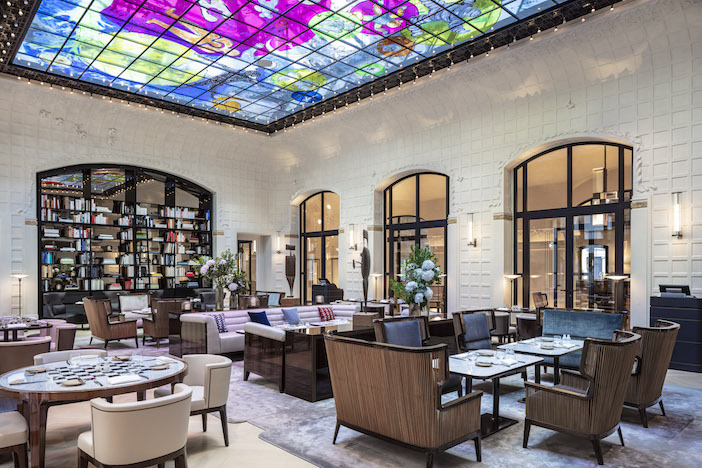 In this restaurant, the glass ceiling, which for decades was covered, has been restored and enhanced by brightly coloured work by artist Fabrice Hyber. The restaurant’s menu of contemporary French cuisine with Asian touches includes super-fresh red tuna tartar with avocado and ponzu dressing, and seabream with Jerusalem artichoke mash, nashi pear, hazelnut and lovage. Desserts include hibiscus poached pear with a herbal foam, and rum baba with tonka cream. Mini pastries are served with the coffee. Another discovery during the renovations was an original fresco in Bar Joséphine, named after the aforementioned Josephine Baker, who danced on the tables and sang here in the days when the curtains would have been drawn and smoke filled the air. The 10-metre-long bar’s walls now display frescoes dating back to 1910; 17,000 hours were spent carefully removing six layers of paint to expose its floor-to-ceiling images of grapes and vines, like a shrine to Bacchus. This busy, jazzy, street-side bar is now open to the public and appears to be a local favourite. If peace and quiet is more your thing, there is a library on the ground floor, where you can read one of the hotel’s many books on art and architecture or choose a literary work. 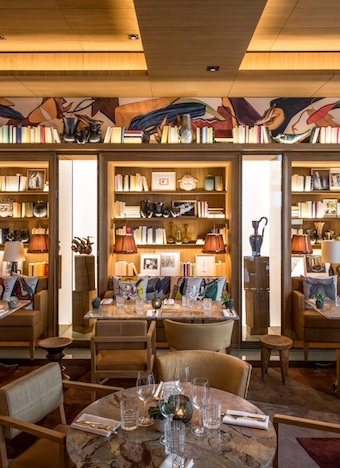 Like Bar Joséphine, the library is open to the public. Alternatively, the 700 square metre Akasha Holistic Wellbeing Centrehas a 17 metre pool with natural light as well as treatments and fitness classes for guests and members. After one of the best night’s sleep I’ve ever had, I head to L’Orangerie on the ground floor, also once a dark space and now opened up to welcome in the new day. You can order pretty much anything for breakfast but my free-range eggs were perfectly poached and there’s a generous choice of Bircher muesli, freshly baked breads and patisserie, yogurts, and pretty much anything you could wish for before you head out into Saint-Germain-des-Prés. There’s plenty to explore in the area, including notable landmarks such as the Musée D’Orsay and Luxembourg Gardens, but I’d recommend a visit to the fascinating Musée Yves Saint Laurent Paris, where exhibitions change every few months (we saw the remarkable ‘Dreams of the Orient’ exhibition, filled with haute couture designs inspired by visits to India, China and Japan). I particularly loved his studio (always available to view), his desk left just as he liked it, as if he’d popped out to buy some cigarettes and might reappear at any moment. Along with the sharpened pencils, glass paperweights and notepaper are art books, colour swatches, sketches, black and white photographs, and a little bowl by his feet for his beloved French bulldog Moujik. 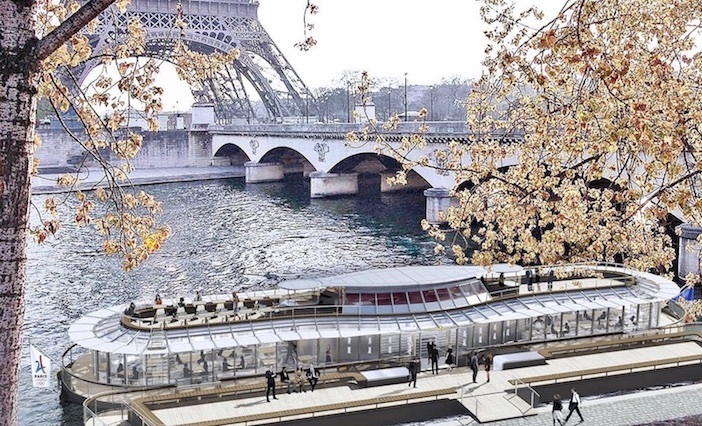 For lunch, we headed to Pont d’Iéna near the foot of the Eiffel Tower, to board Alain Ducasse’s new floating glass-sided restaurant Ducasse sur Seine. Four-course lunch cooked by one of the country’s most celebrated chefs, enjoyed while taking in the sights and sounds of the City of Lights? Don’t mind if I do. We started with an intensely flavoured Paris mushroom royale (even the butter to go with the freshly baked bread had a wave imprint), then I chose the delicate sea bream gravlax and beetroot, followed by an autumn vegetable casserole. My dessert was caramelised apple, tonka bean and vanilla, all served with a 2016 Puligny-Montrachet and a 2012 Saint-Emillion Grand Cru and followed by coffee and petits fours. After such a feast, it’s time for a stroll. There are plenty of luxury boutique shops in which you can spend your euros including Inès de La Fressange on Rue de Grenelle for chic clothing, joy-sparking pieces for the home and stationery. Think eclectic objects of beauty. You may even, as we did, meet the muse-worthy and charming Inès, once one of the world’s top models for the likes of Yves Saint Laurent, Dior, Gaultier and Chanel. She was even chosen to represent Marianne, symbolic of the French Republic, which is about as French as it gets. 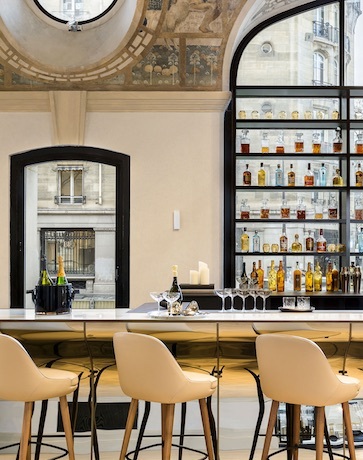 Also in the area is the restaurant at the Brach hotel, designed by Philippe Starck and quite a contrast from the restaurants in Hôtel Lutetia. Here the atmosphere is funky, loud, busy and very social. Cocktails, mocktails, juices, wines, whiskies, whatever you like, can be enjoyed with sharing plates of arancini, houmous with sumac, goats’ cheese, or risottos, pastas, fish, seafood and steaks. The restaurant has its own bakery, so for dessert select your pastries at the counter and they’ll be brought to you in a paper bag. About five minutes’ walk from Hôtel Lutetia in the cool new Beaupassage food and arts precinct is Allénothèque. Before you eat at this excellent restaurant with its open kitchen, be sure to visit the wine cellar in the basement and the contemporary art and interiors gallery upstairs, which set the tone for the modern French cuisine sandwiched between on the ground floor. Talented chef Yanick Alléno creates modern French dishes including my superb steamed and fragrant red mullet, which arrived in a bamboo basket and was served with cherry leaves and palm mash. It was followed by an indulgent chocolate tart with coffee cream; the red fruits served with vanilla cream also looked beautiful and is worth a mention. After all this food and luxury we felt too lazy to walk, so for a different take on the area we decided before we left to ride through the streets on the back of World War II motorbikes Retro Tours, a company set up and run by agroup of exuberant young Frenchmen. As it was a Sunday and there was little traffic, it was easy to zip around Saint-Germain-des-Prés and see again what a picturesque area this is with its boutique stores, art shops, galleries, restaurants and cafés. As we approached our hotel to dismount, I was struck again by Hôtel Lutetia’s Art Nouveau good looks, and felt that another afternoon luxuriating in her newly light-filled interiors would be very welcome indeed. 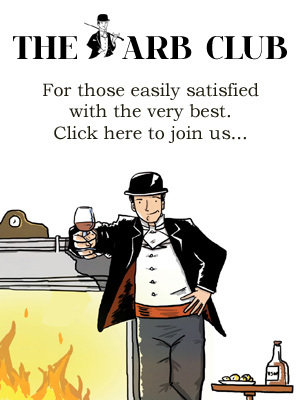 At least the journey back to London is just two-and-a-quarter hours on Eurostar from nearby Gare du Nord, with luxe business-class lounges either end in which you can help yourself to the latest editions of glossy English and French magazines. By the time you’ve pored over Vogue and Harper’s Bazaar, you’re back in St Pancras International, welcomed by Tracey Emin’s I Want my Time with You installation, a message of love to Europe. You said it, Tracey. 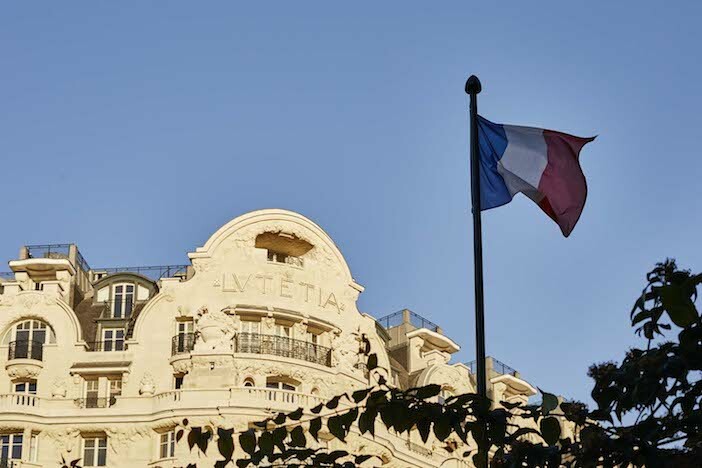 For details and room rates at Hôtel Lutetia, visit www.hotellutetia.com. For ideas on what to do in Paris, visit www.en.parisinfo.com. Karen travelled business class to Paris on Eurostar from St Pancras International. For more information, including bookings, visit www.eurostar.com.